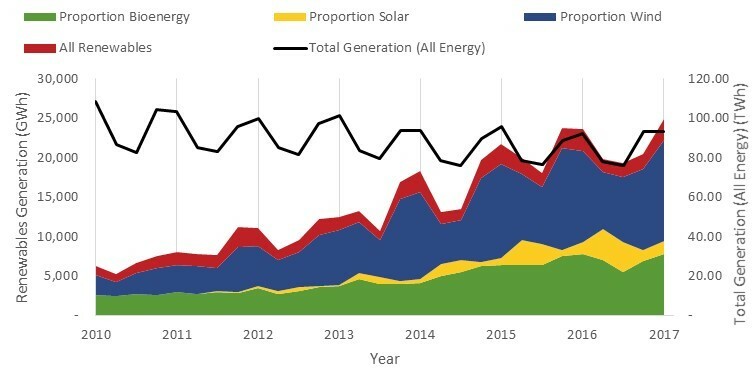 On the 29th of June, the UK Department for Business, Energy & Industrial Strategy (BEIS) released the country’s quarterly electricity data, indicating both the capacity for electricity generation from various sources, and the actual level of generation that has occurred. These data (and attached statistics) aren’t widely publicised, so here follows a summary of how bioenergy holds up in the UK’s electricity generation picture. We define Bioenergy as an umbrella term for the following five electricity sources featured in the data: Sewage Sludge Digestion, Landfill Gas, Animal Biomass, Anaerobic Digestion and Plant Biomass. In terms of both capacity and generation, biopower generation is heavily dominated by plant biomass, which, at nearly 3GW of capacity, accounts for over 60% of the UK’s bioenergy infrastructure, and over 75% of its generation. 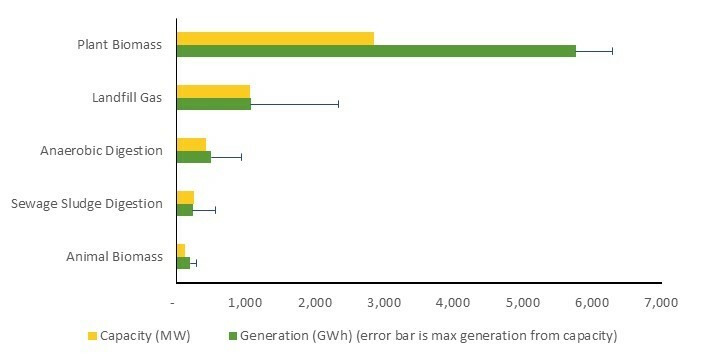 Since last quarter, there has been an increase of nearly 20% in generation from the bioenergy sector, which is lower than for renewables as a whole, but since total UK electricity generation remained approximately the same as last quarter (an uncommon occurrence, as Q1 tends to be the highest-generation quarter, due to more demand during the darker months), this is a good sign. Comparing to the same quarter last year, bioenergy capacity has increased by nearly 5%, a rise driven by Anaerobic Digestion and Plant Biomass, both of which have seen capacity increases of over 50MW (which is a bigger deal for AD – this amount equates to a 15% increase in capacity). Despite this, power generation from AD is down approximately 8.5% on last quarter, with output from all other bioenergy sources being up by around 20%. Although relative increases are good to assess a technology’s progress in development, it should be noted that Plant Biomass’ dominance is still very much evident when looking at the real increases – generation is up by over 1TWh on last quarter. The data also reveal trends in bioenergy since 2010, which offers long-term insight into where the bioenergy piece fits in the renewables puzzle. In 2010, bioenergy’s contribution to the UK’s total electricity generation was 1.5%; in the ensuing 7 years this has risen to 8%. This increase is in keeping with increases in renewables as a whole, as evidenced by bioenergy’s share of renewable generation remaining reasonably consistent, at around 15%. The makeup of the bioenergy sector also has a noticeable bearing on how each technology has developed over the time period covered in the data. Anaerobic Digestion, for example, which is a sector built around many small-scale plants, has seen consistent levels of growth since 2010, as new plants pop up all around the country. Compare this with the plant biomass sector, which is dominated by large scale producers such as Drax, and thus sees more sporadic increases in capacity, but these are of far greater magnitude than anything experienced in the other sectors. One example of this is Drax setting about converting their coal stations to burn wood pellets. In terms of generation, all of the individual sub-sectors within bioenergy have remained reasonably consistent in their increases, with the notable exception once again being Plant Biomass, which, in line with big capacity increases, sees large, stepped increases in its generation, with no significant relative growth in the meantime. One thing that sets bioenergy apart from other renewables such as solar and wind power is the comparative lack of external factors that influence generation. Bioenergy Load Factors are always higher than for renewables as a whole, and also do not suffer from the seasonal fluctuations seen in solar and wind. This indicates that while other renewables are slated to bring the majority of renewable electricity both at present and in future, bioenergy can be the solid foundation upon which a renewable electricity industry can grow and flourish. The BEIS data may be found here.